There was no fallout from the Ozzie Guillen and Bryce Harper saga, but the Nationals were still hit in the mouth by the Miami Marlins, suffering a 5-3 loss on Monday night in south Florida. The Nats notched 11 hits, 9 of them coming from only 3 players, but they stranded 8 runners and hit only 1 for 7 with runners in scoring position. Edwin Jackson pitched only 5 innings and gave up 6 hits and 4 of the 5 Marlins runs. It wasn't his worst performance of the season but the Nats bats were not hot enough to generate more than 3 runs. The Nats offense was a three headed monster. 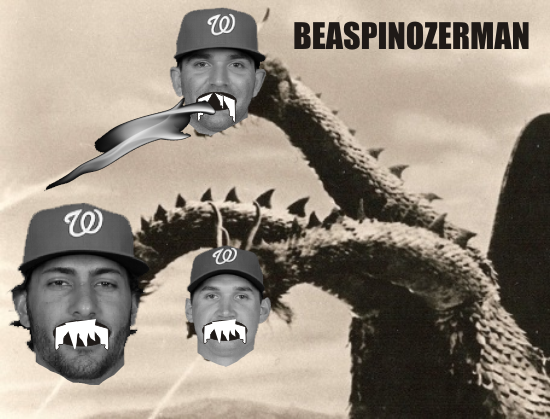 Michael Morse, Danny Espinosa, and Ryan Zimmerman (or Beaspinozerman) combined for 9 hits, 3 each. Zimmerman & Espinosa each fell short of the cycle missing by a homer and a triple respectively. Zim was on base all 5 times he came to the plate. The Nationals hit into 4 double plays, 2 to end innings including a backbreaking GIDP by Jesus Flores in the 6th inning that squandered a bases loaded 1-out situation. Sidenote: The Marlins have a weird mascot race at their ballpark where 4 giant mutated sea creatures race around the ballpark. One of the players in the Marlins dugout decided to pull a Randall Simon and mess with the mascots. 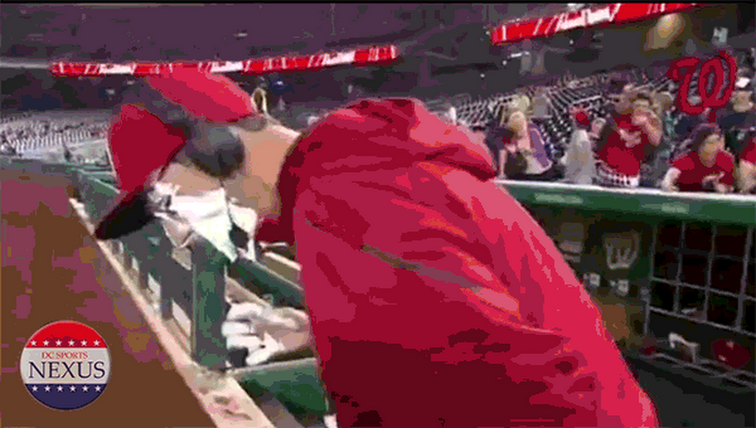 However, instead of hitting one in the head with a bat, the mystery player just threw a cup of water on them. What a great prank. You really soaked them. Terrible Video below. Aren't you glad you wasted those 15 seconds? With the loss the Nats and Marlins 4 game set ended up in a tie. The Nats come back home on Tuesday for a 3 game set against the Mets.